DUMBO stands for "Down Under the Manhattan and Brooklyn Overpasses" and it represents the Brooklyn neighborhood that's closest to the Brooklyn Bridge. The area has become a big NYC tourist attraction with many people who walk the bridge stopping for a drink or to stroll around its historic streets. DUMBO is home to several eclectic cultural institutions including BargeMusic and St. Ann's Warehouse, and it boasts a handful of well-known food establishments. You can enjoy pizza at Grimaldi's and chocolate at Jacques Torres, not to mention fine dining at the River Cafe and a great bar scene at Superfine. While the DUMBO area offers visitors world-class views of Manhattan and the fabulous Brooklyn Bridge Park, there's almost no parking in this neighborhood—and very few parking garages. As there is very little street parking, it may be best to walk or take public transportation to DUMBO, especially if you're attending a big cultural event like a concert in the park. However, if you do drive, or want to park the car before or after walking the Brooklyn Bridge, there are a few parking garages nearby. If you absolutely must drive, there are several parking garages within walking distance of the Brooklyn Bridge and the Brooklyn Bridge Park. Due to the popularity of the area, though, the pricing for parking can be quite expensive. There are also parking lots in Brooklyn Heights, which is about a half mile away. If the weather's nice, a walk through Brooklyn Heights' old brownstone apartments and pre-war buildings is worth the lower prices at these garages. If you don't want to spend money on parking, you could always take a cab or use a rideshare app like Uber or Lyft to get you to DUMBO—which is something even locals do to get here for work. However, if you want to save the most money, you can also access DUMBO within a few minutes from one of the city's many subway lines. From Manhattan, you can take the F to York Street station, the A or C train to High Street - Brooklyn Bridge station, or the 2 and 3 trains to Clark Street subway station. DUMBO is just a five-to-10-minute walk from each of these, but the York Street station is the closest to the neighborhood. Alternatively, you could enter the south side of the park by accessing the Court Street station via the N, R, and W trains or the Borough Hall stations via the 2, 3, 4, and 5 trains. 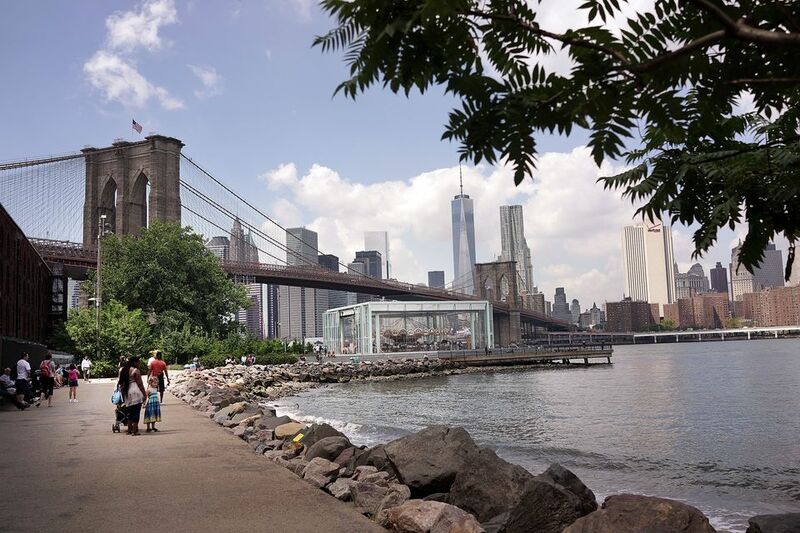 From here, you can walk along the Brooklyn Heights Promenade and take in gorgeous views of the lower Manhattan skyline as you head north toward Brooklyn Bridge Park.